What are Custom Shipping Methods? Custom Shipping Methods are a powerful feature in AmeriCommerce Online Stores that allow you to create your own shipping options that calculate order shipping charges based on the rules you set. Custom shipping methods can charge different amounts for shipping based on order subtotal, number of order items, weight units, shipping region, customer type, shipping warehouse, and other criteria. This article will explain custom shipping method rules in detail as well as explain how to create custom shipping methods for three common use cases: Free Shipping, Flat Rate Shipping, and Variable rate shipping. At the end of the article are troubleshooting tips and a detailed explanation of each custom shipping method setting. If subtotal is between 50 and 99,999 Dollars, shipping is 0 dollars plus 0 dollars to every region, from every warehouse, for customer type of all types. The upper and lower bound amounts are inclusive, meaning that this method will give free shipping to orders with a $50.00 subtotal, but not orders with a $49.99 subtotal. The shipping region, warehouse, and customer type options shown above are examples only. 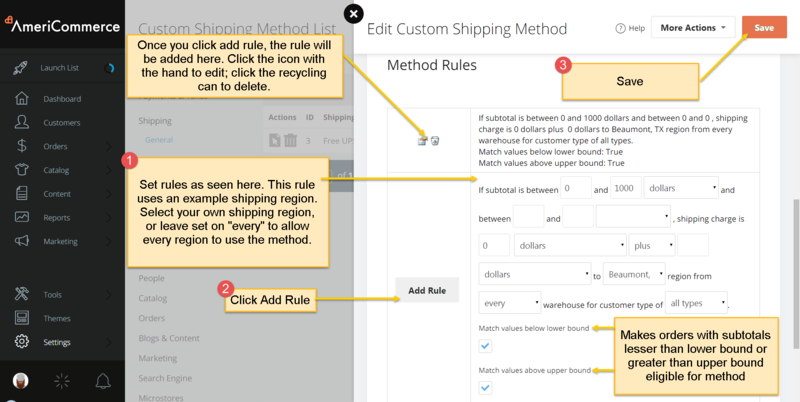 You will need to setup your own shipping regions, warehouses, and customer types before those options will be available in shipping method rules on your online store. 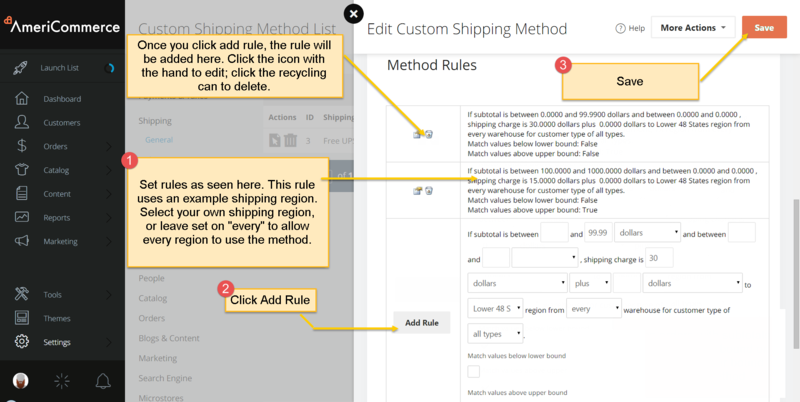 Custom shipping methods must have at least one rule to function, but multiple rules are allowed, and each rule can have a different combination of the above selections. This configurability makes Custom Shipping Methods a powerful feature, and gives store owners the flexibility needed to account for real world shipping scenarios. If subtotal is between 0.0000 and 1000.0000 dollars and between 0.0000 and 0.0000 , shipping charge is 0.0000 dollars plus 0.0000 dollars to Beaumont, TX region from every warehouse for customer type of all types. If subtotal is between 0.0000 and 99.9900 dollarsand between 0.0000 and 0.0000 , shipping charge is 30.0000 dollars plus 0.0000 dollars to Lower 48 States region from every warehouse for customer type of all types. If subtotal is between 100.0000 and1000.0000 dollars and between 0.0000 and0.0000 , shipping charge is 15.0000 dollars plus 0.0000 dollars to Lower 48 States region from every warehouse for customer type of all types. 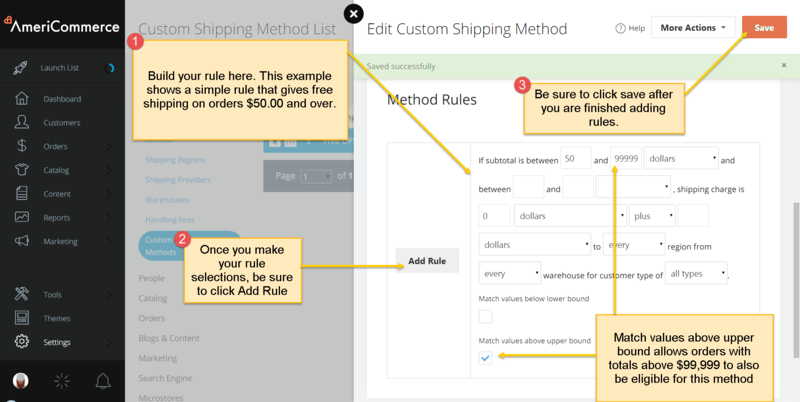 Note: This example assumes you already know how to create a shipping method and add rules. If you need a step by step example on creating shipping methods, see Setting up a Free Shipping Option and Setting Up a Flat Rate Option above. The package weight does not meet the weight rules (note: shipping weight is always converted to pounds for shipping weight rules). If you've been making lots of recent edits to a shipping method, you may need to clear your cart and re-add the items, or test in a private/incognito window to see the most recent edits reflected on the shopping cart or checkout page. Fallback Method: Custom Shipping Methods with Fallback enabled are ONLY used if all enabled shipping providers are temporarily down. They will not be available to the customer in normal circumstances. Use Store Base Shipping Rate: The Store Base Shipping Rate allows you to specify a base charge for custom shipping methods. This base charge is applied to the overall shipping as determined by a custom shipping method. 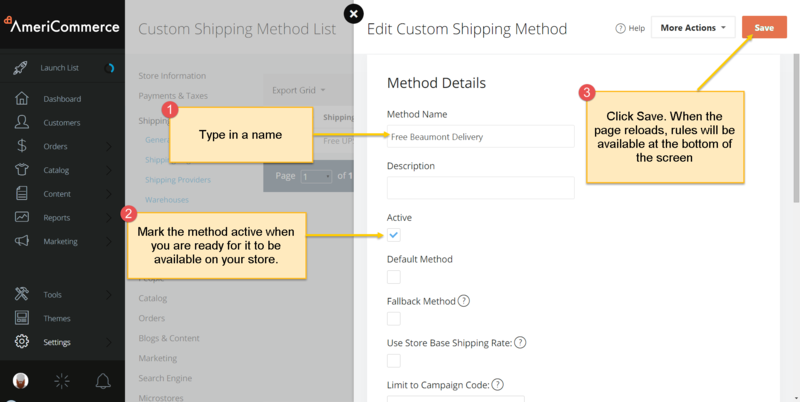 Limit to Campaign Code:Only enable this custom shipping method if the following campaign code is applied on the cart. Visit the How to Setup Campaign AdCodes article for more information on Campaign Codes. 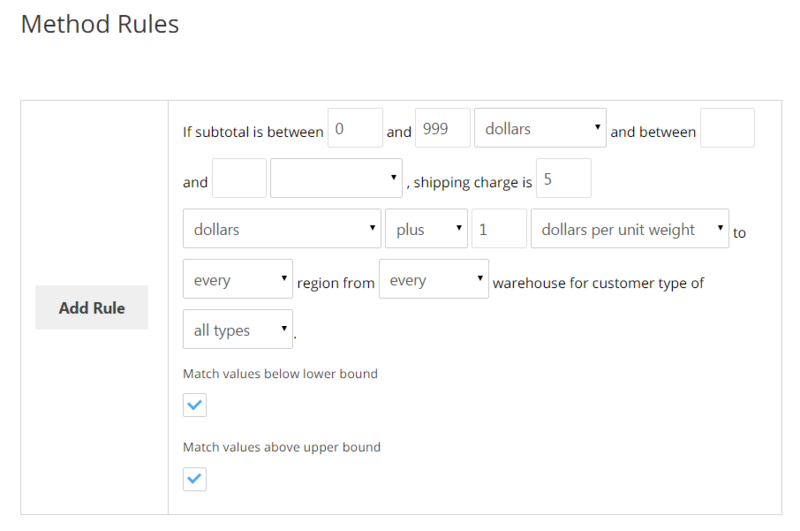 Combine shipping value for warehouse based shipping rule: This setting will decide custom shipping is warehouse based or package based. For example: Free shipping when subtotal >= $100 from a warehouse. Package A is 60lbs, and has a subtotal of $60. Package B is 40lbs, and has a subtotal of $40. When combine shipping value for warehouse is selected, subtotal, weight, # of Items from all packages for the warehouse will combined to evaluate shipping rules. Subtotal from Package A and B will be combined because they are from the same warehouse. The subtotal is $100; free shipping is available for this order. When not selected, each package will use its own subtotal, weight, # of items to evaluate shipping rules. Every package must pass the shipping rules. Subtotal for each package ($60, $40) is less than $100; free shipping is not available to this order. Match values below lower bound: When this is checked, the method will be available on orders with subtotals less than the lower bound specified in "If Subtotal is between ____ and ____". Match values above upper bound: When this is checked, the method will be available on orders with subtotals greater than the upper bound specified in "If Subtotal is between ____ and ____".